Tower Quest from Play'n GO is a fantasy slot game that takes you on a journey to defeat the evil wizard. You and your friends embark on a dangerous adventure and face many obstacles, but you can also reap great rewards along the way. The beautifully drawn fantasy symbols include dragons, heroes, monsters and wizards, as well as the tower and standard game symbols. The thrilling background music makes playing this game even better and will contribute to keeping up the suspense. 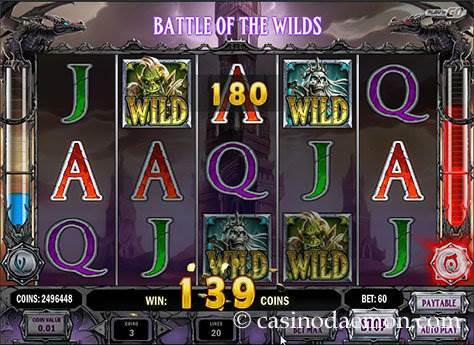 However, what makes this game really special are the many interesting features that include different free spins with special features, a bonus game and wild substitutions. 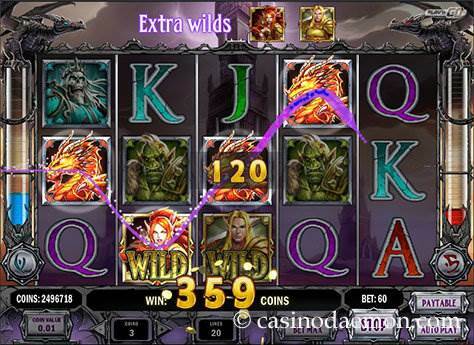 The variance of the slot is medium, and you will probably get winning combinations with smaller amounts more regularly than with larger amounts. This game is best played for a while, as it will take some time to trigger the free spins, but once you have started them they can really make it worth your while. The theoretical return to player is 96.24%, which is average for a slot game. 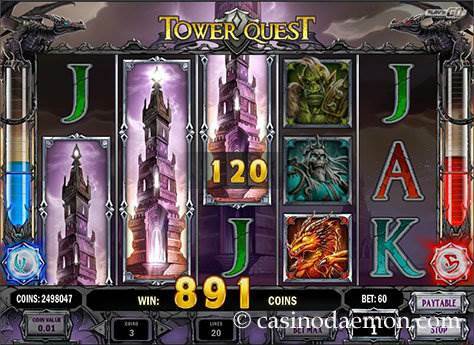 You can also play Tower Quest mobile on many different devices, as the game is optimised for mobile casinos. 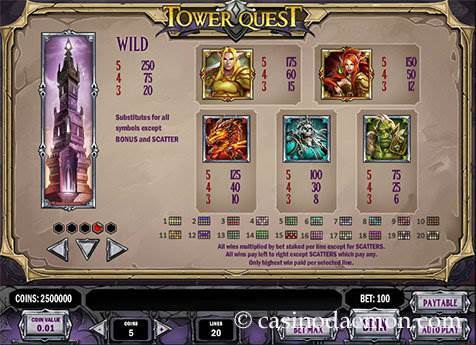 You can play Tower Quest for free on this page and is try to game that any obligation to register in a casino. If you wish to play it for real money you can find it at one of the online casinos listed on this page. The tower is a stacked symbol that can appear on the whole reel and cover up to 3 positions. It is the wild symbol in the game and it can stand in for any other symbol to create winning combinations, but it cannot stand in for the scatter symbols or the bonus game symbol. The game has two scatter symbols, one red and one blue flask and each time you get them on the screen the contents will be poured in the respective meter on the side of the reels. Once you've collected enough symbols you can trigger the corresponding free spins. Each colour has their own special features, for example sticky wild symbols, wild reels, extra wilds or win multipliers. The bonus game starts with three wizards. In this game you can play a game of cards against the evil wizard and get a chance to defeat him. You can win up to 500x the total bet in this game. The Tower Quest slot from Play'n Go is a 5-reel slot with 20 fixed pay-lines. The game can be played with coin values between 0.01 and 1 £/$/€, and you can play up to 5 coins per line. The minimum bet size is 0.20 £/$/€, and you can play maximum of 100 £/$/€ in one round. Automatic play is also possible.